Being on a low-sodium diet, you sure do miss the convenience of pre-made BBQ sauce – especially when you’re busy. Well, friends, weep no more for that beloved bottle. Here’s a delicious all-purpose sauce for grilling, basting or dipping that you can whip up quick as a wink. Pssst: It’s so good, they’ll never guess it’s salt free! Combine sauce ingredients in a small pan and simmer over medium-low heat for 10 minutes. 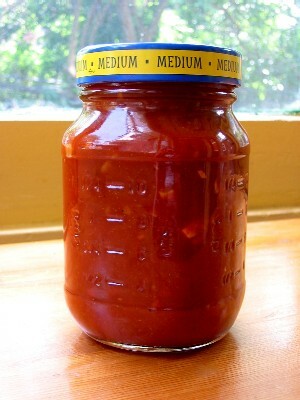 Remove from heat and pour into a clean lidded jar or other airtight container. Refrigerate until use. This entry was posted in Dips and Condiments, Sauces. Bookmark the permalink. I am so glad to have found some of your recipes on Pinterest. My husband was recently diagnosed with renal disease. (Just 3 weeks post op from a partial nephrectomy. His kidneys will be checked at his appointment next month to tweak how I should be cooking for him. We do know to go ahead and cut back on sodum. How do I follow you on Pinterest? This BBQ sauce recipe was way too spicy for my husband and I. It got thrown out. I will keep teying your other recipes. I was hoping fo r something more like sweet baby ray’s BBQ. That stinks, Laurie! SO sorry to hear it. I’m not familiar w/ Sweet Baby Ray’s BBQ sauce, but the name sounds delicious! LOL Maybe this one would work better for you? Low Sodium Barbecue Sauce from Food.com.